Part of a previously unknown piano concerto by Beethoven will be performed for the first time in Rotterdam. The 1789 adagio was found as a rough outline in the British Museum then formed into an eight-minute piece. Dutch pianist Ronald Brautigam will play the piece in a Rotterdam Chamber Orchestra concert on Tuesday. "As far as we know, Beethoven did write a whole concert that included this adagio and disappeared," said orchestra conductor Conrad van Alphen. The piece was discovered as a rough outline of themes but Dutch musicologist Cees Nieuwenhuizen formed it into an eight-minute adagio. "It is clearly a piece from his youth but not of a first-timer," said Mr Van Alphen. "In 1789 Beethoven had already started work on his second piano concerto. The piece will be played alongside works by Schubert, Haydn and Mozart at Rotterdam's De Doelen concert hall. In 2003 the orchestra performed the Largo movement of Beethoven's Oboe Concerto in F Major, which had been lost for 160 years. By TOBY STERLING, The Associated Press. ROTTERDAM, Netherlands (AP) - Part of a piano concerto Beethoven outlined when he was a young man premiered in Rotterdam Tuesday night, reconstructed by experts after three centuries. The Rotterdam Chamber Orchestra performed the 10-minute adagio, or slow movement, as the centerpiece of a night of classics, drawing respectful applause and some standing ovations from an audience of around 1,000. "To be able to perform a Beethoven piece that's never been performed, that's amazing," said South African conductor Conrad van Alphen. "It's absolutely an honor." Ludwig van Beethoven wrote the main themes of the piece in 1789, when he was just 19-years-old. He titled the draft "Concerto in A for Piano" and gave instructions for other instruments, but left unfinished phrases, writing only "etc., etc." Dutch musicologist Cees Nieuwenhuizen orchestrated the movement using Beethoven's notes and adhering to the master's early style, which was heavily influenced by Mozart. Beethoven "was young when he wrote it, but he was naturally a man of genius," Nieuwenhuizen said. "It has moments of the impulsiveness, the contrasts and tensions that made his later work so great." The adagio was found among bundles of Beethoven's sketches and drafts in the British Library, first published in 1970. 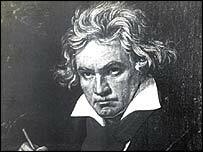 Beethoven is not believed to have written the opening or closing movements. Beethoven was living in Bonn, Germany, when the piece was constructed, and shortly after moved to Vienna to study with fellow composer Joseph Haydn. It would be several more years before he published his Opus No. 1, announcing himself as a composer. Conductor Van Alphen said the piece bore similarities to Beethoven's 3rd concerto, written a decade later. "The opening has exactly the same mood, the same emotional calm" as the later work, he said. Concertgoer Dina Kaalman-Schippers said the piece was "a little weak, a little timid, but I'm not an expert." She said it "lacked the oomph that you would usually think of when you think of Beethoven." Piano soloist Ronald Brautigam, a Beethoven specialist, said the piece was not as challenging technically as some of Beethoven's later work, but it "has his musical fingerprints." For instance, "in the opening two bars you hear a harmonic that he uses a lot later." He said the work would never compare with Beethoven's mature concertos or great symphonies, but it was interesting and beautiful anyway. "Every bit of information about the great composers is important, especially Beethoven," he said. Beethoven, who in 1789 would have considered himself more a virtuoso pianist than a composer, made occasional notes in the margins. "This is the only fortissimo in the whole thing, no others should be heard at all," he wrote at one point when the orchestra was to come in after a solo. Nieuwenhuizen, a contributor to the Beethoven Journal published in San Jose, California, worked for more than a year on the reconstruction. "You could say we had to finish Beethoven's sentences," he said, drawing harmonies from other works from the same period. Nieuwenhuizen and the Rotterdam orchestra premiered a reconstructed Beethoven concerto for oboe last year. Nieuwenhuizen said they plan several more premieres in the coming year, including an 1817 prelude and fugue for violin. "That's a fantastic piece, impulsive and bizarre," he said. Some parts of a blog on the research website of the Beethoven Haus in Bonn. Können sie mir evrtl nähere Informationen dazu geben (genauere Angaben um welches Stück es sich handelt (Hess-Nummer, Skizzenbuch oder ähnliches) und wissen sie evtl. ob das Stück als CD erhältlivh sein wird, oder können sie mir sagen wo ich solche Informationen bekommen kann. Vielen Dank für Ihre Hilfe und für Ihre Arbeit alles Gute. Ein besonderes Lob noch für das grossartige Beethovenhaus und ihre hervorragenden Internetseiten. Nach unserem Kenntnisstand handelt es sich um ein Skizzenblatt, auf dessen Basis unter Hinzufügung von Orchesterstimmen ein Satz eines Klavierkonzerts geschrieben worden ist. Dieses Stück können Sie sich über das Internet anhören: www.npr.org/templates/story/story.php?storyId=4485919. Ohne die Noten vorliegen zu haben, kann hier kein detaillierter Kommentar erfolgen, doch sind solche "Weltneuheiten" nicht selten - zumal der Name Beethovens immer wieder für Schlagzeilen gut ist. Auch Beethovens verschollenes Obenkonzert wurde schon auf diese Weise "uraufgeführt", und es gibt Versuche, seine 10. Symphonie zu schreiben. Deshalb hier einige grundsätzliche Bemerkungen: Skizzen und Arbeitspapiere Beethovens sind lediglich für ihn selbst bestimmte Gedanken und Notizen, die er sich zur möglichen weiteren Verwendung festhielt. Es sind Tausende solcher Skizzenblättern erhalten. Sie sind wichtig für das Verständnis von Beethovens Arbeitsweise, sind aber keinesfalls die Kurzfassung eines fertigen Werkes. Während des Kompositionsprozesses wurde von Beethoven vieles wieder verworfen, erneut überarbeitet und korrigiert, bis er am Ende ein Werk veröffentlichte. (Nähere Informationen und Anschauungsmaterial finden Sie im Digitalen Beethoven-Haus.) Wenn eine Komposition Beethovens nicht vorhanden ist, dann existiert eben dieses Werk nicht (oder nicht mehr) und lässt sich weder aufführen noch rekonstruieren. Interessanterweise käme wohl niemand auf die Idee, auf der Basis einiger Farbtupfer oder Striche eines genialen Malers einen "rekonstruierten" unbekannten Rembrandt oder Delacroix zu malen und als Weltneuheit zu präsentieren. Ich kann mich über das Adagio für Klavier und Orchester von Cees Nieuwenhuizen nich äussern, möchte aber Ihre Bedenkungen über das Oboekonzertes (Hess 12) nuanzieren. Es sind nämlich nicht sosehr konzeptuelle Skizzen zum Largo dieses Konzertes erhalten (die würden sich schwerlich rekonstruieren lassen), sondern eine komplette 'continuity draft', d.h. ein fertiger Satz in Skelet-Form. Diese ist sehr wohl rekonstruierbar, weil es tatsächlich, wie sie es nennen, eine 'Kurzfassung eines fertiges Werkes' ist. Es brauchte somit nichts oder nur sehr weniges 'dazukomponiert' zu werden. Wir wissen aus zahlreichen Briefen und Dokumenten, wie sehr Beethoven (oft vergeblich) dafür gekämpft hat, daß seine Werke nur in der von ihm autorisierten korrekten Fassung veröffentlicht wurden. Vor diesem Hintergrund bin ich skeptisch gegenüber Versionen, die auf der Basis von mehr oder weniger vollständigen Arbeitspapieren Beethovens ergänzt werden. Bearbeitungen aufgrund von Werken berühmter Komponisten hat es immer gegeben, nur sollte man klar darlegen, um was es sich wirklich handelt und den Begriff "rekonstruiertes Werk Beethovens" meiden. Er suggeriert, daß eine fertige Komposition nun endlich wieder in ihrer ursprünglichen Fassung verfügbar sei - und das entspricht nicht der Wirklichkeit. Wünschenswert wäre, zumindest die tatsächliche Quellenlage darzulegen - genau das geschieht nicht, wenn solche Schlagzeilen in den Medien auftauchen. Over wat hem drijft, hij duidelijk. 'Beethoven is een fascinerende man, in een fascinerende tijd. Er zit in zijn muziek een drive die je altijd weer raakt. Die man stopte zijn hele persoonlijkheid in zijn muziek. Voelt hij zich rot, dan hoor je dat. En is zijn stemming vrolijk, dan hoor je dat ook. Hij verstopt zich nooit. Helemaal nooit, zelfs niet in zijn slechte stukken. Hoe beroerd misschien ook, het blijft Beethoven die je hoort. Dagblad Tubantia Twentsche Courant BV. February 4, 2005 - A piano concerto Beethoven was working on when he was 18 years old premiered Feb. 1 in Rotterdam. Reconstructed by Dutch musicologist Cees Nieuwenhuizen, the work was found in 2004 among a group of Beethoven sketches and drafts in the British Museum. based on the composer's markings and notes. with Ronald Brautigam on piano. group of Beethoven sketches and drafts in the British Museum. ROTTERDAM - In de Rotterdamse Doelen ging gisteravond een pianoconcert van Beethoven in premiere. Op basis van de aantekeningen die Beethoven in 1789 maakte voor een nooit voltooid pianoconcert, reconstrueerde de Alkmaarse componist en musicoloog Cees Nieuwenhuizen het werk. Pianist Ronald Brautigam speelde het, begeleid door het Rotterdams Kamerorkest. Morgenavond wordt het stuk gespeeld in Kampen. Er is intussen meer 'Beethovenhertselwerk' onderweg: een verloren strijkkwartet en een vioolconcert volgen nog. Pianist Ronald Brautigam (rechts) speelde een nooit voltooid pianoconcert van Beethoven, dat gisteravond in Rotterdam zijn wereldpremiere beleefde. A long-lost adagio by Beethoven will be performed for the first time next month. The Rotterdam Chamber Orchestra will perform the eight-minute piece on Tuesday, conductor Conrad van Alphen said yesterday. Beethoven likely wrote the draft in Vienna in the 1790s, when he was in his 20s. It was found among bundles of his sketches and drafts in the British Library and published in 1970. It matches "very much, exactly the mood of Beethoven's third concerto," Van Alphen said. "It's calm but deeply emotional." The piece will be performed in Rotterdam's main concert hall with Dutch pianist Ronald Brautigam as soloist. The orchestra premiered a similarly reconstructed Beethoven concerto for oboe last year.